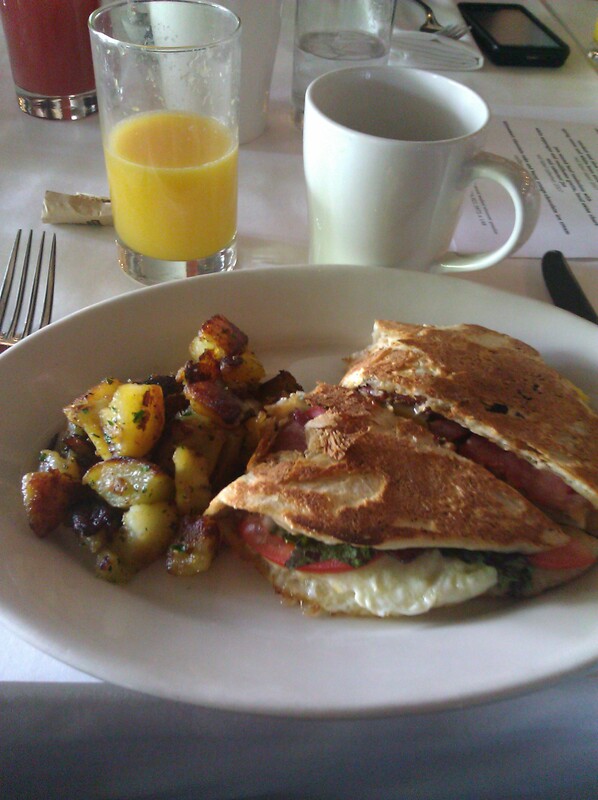 One of my favorite places to brunch is Fire Food and Drink on Shaker Square. It is close to my house and offers delicious food. And in nice weather the patio offers great people watching – especially when the Shaker Square Farmer’s Market is in full swing. One of my favorite things on their menu is the egg sandwich, which features clay bread, local fried eggs, bacon, lettuce, and tomato and is served with a side of home fries. The clay bread is cooked in their tandoori oven and very similar to Indian fry bread. You can also order a side of it sprinkled with cinnamon sugar as an appetizer. The sandwich itself is simple but delicious. Paired with a fresh squeezed orange juice and coffee, this is the perfect way to start a day and a weekend. 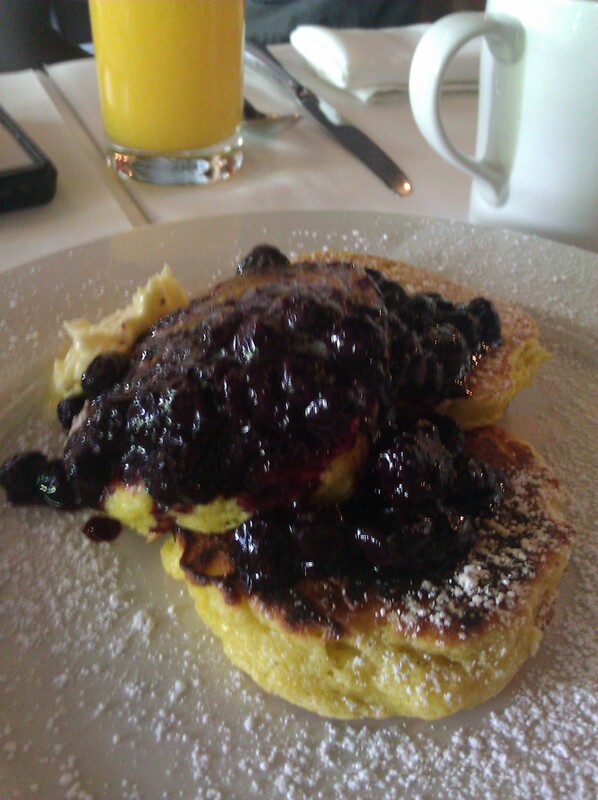 If you are in the mood for some carbs, they are known for their almond-stuffed french toast (featuring local strawberries, toasted almonds and local maple syrup), lemon souffle pancakes topped with blueberry compote, and the house cured salmon plate. The lemon pancakes (pictured to the left) are light and not as heavy as they look in the photo. The blueberry compote is absolutely delicious. If I could have ordered a bowl of that alone I would have. 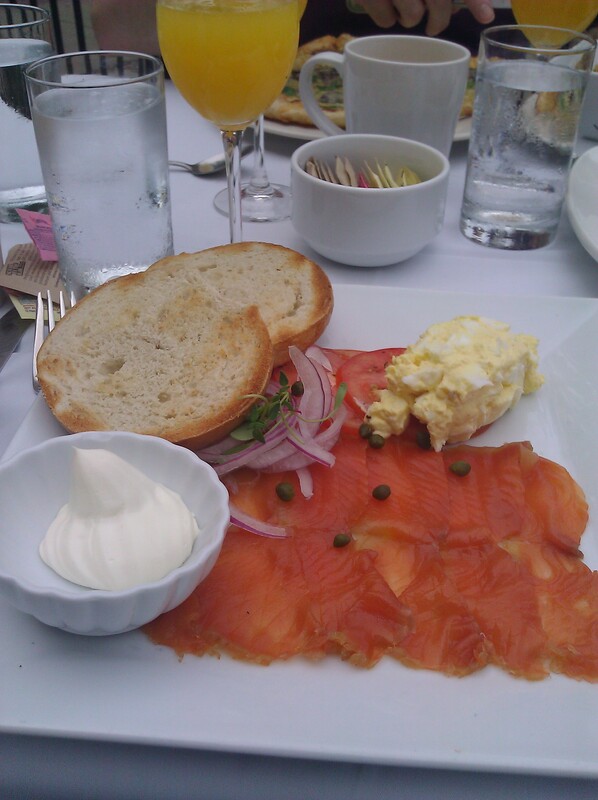 The house cured salmon plate features smoked salmon, a Bialy’s bagel, homemade egg salad, shaved onion and capers. The egg salad is perfectly seasoned and is a great addition to the smoked salmon plate. Usually salmon plates come with cream cheese. The egg salad is a really nice change. Any place that serves Bialy’s bagels is okay in my book. Bialy’s makes the best bagels around. One item that you might easily overlook on the brunch menu is the steel cut oatmeal. Trust me, you would be missing out. 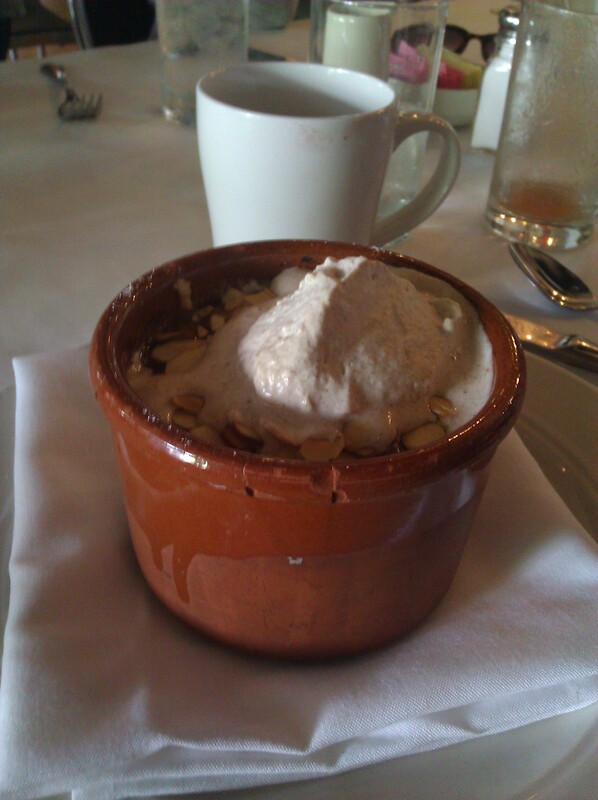 The oatmeal is topped with bruleed bananas, toasted almonds and whipped cinnamon cream. The whipped cinnamon cream alone is worth the price of admission here. It’s absolutely divine! If you prefer a heartier meal I recommend trying the burger or the shrimp fried rice. 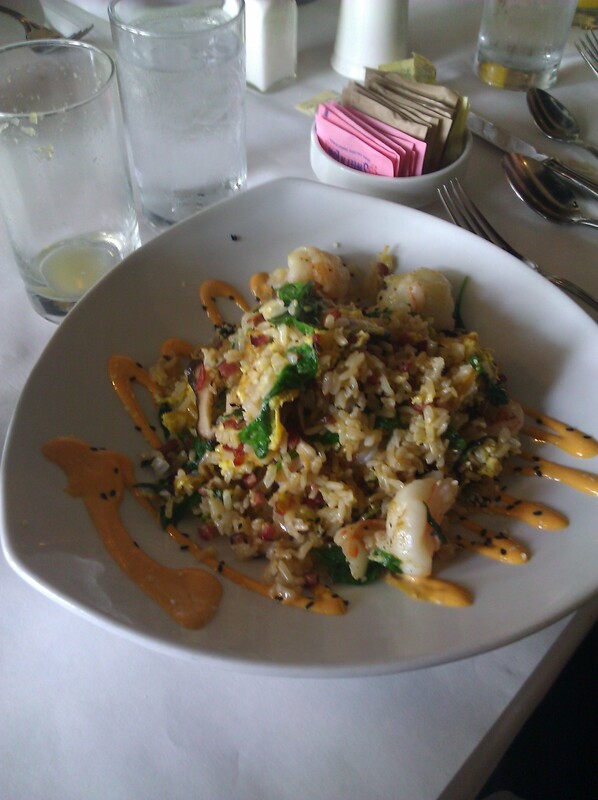 The shrimp fried rice is made with shiitakes, leeks, scallions, bacon, spinach and scrambled egg with chile aioli. The chile aioli is bright and will definitely wake you up! By the way, one of the newest things on the brunch menu is the Tandoor smoked pastrami hash, which was a special the day I ordered but has since made it on the regular menu. 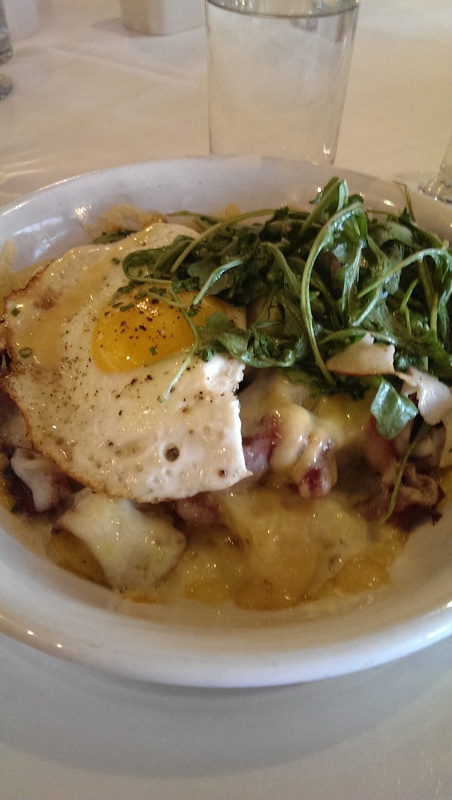 It features smoked pastrami, Yukon potatoes, Emmenthal cheese, honey Dijon aioli, fennel, apple, arugula and a local fried egg. The Dijon aioli was the perfect pairing for this delicious dish. The pastrami fell apart with a fork and I relished every bite of pastrami, potato and toppings. And it wouldn’t be brunch without a Bloody Mary, Bellini or Mimosa. Fire Food and Drink offers all three. They even offer a couple boozy coffees and teas, and the tea is brewed in one of my favorite loose leaf tea pots that you set on top of the cup after it has finished steeping. Bottoms up! Brunch here isn’t the cheapest, but it is definitely one of the best brunches in Cleveland. If your idea of breakfast or brunch is the $3.99 breakfast special you’re in the wrong place, but if you appreciate delicious food you won’t be disappointed. Just be sure to feed the meters or splurge on the valet or your brunch will be expensive indeed.